Editor: Since we were alerted to the Centennial of OB’s famous “Red House”, we asked fellow travelers who once lived there or lived in OB during the Seventies who had memories of the political house and its residents. Here is another “memory” of Red House, by Dickie. I moved into Red House on March 1, 1973, one of 6 activists to take occupancy beginning a long stretch of time when Red House was identified as a center of the OB community movement. We were community and antiwar activists and we had been living for a month across the street on Cape May in the little 4-in-a-row fourplex we called the “Barracks” because it was all activists living there. Ironically, or perhaps appropriately, the morning before we moved we were busted on a minor pot hassle (7 of us for about 1/3 ounce of pot) that stemmed – ‘they’ claimed – from a visit by marshals to serve a dog warrant on someone who was not even living there anymore. Since some among us were known by the police as activists, it escalated into a political event (who remembers the cop in a clown mask who did the search of the apartment?) (Editor: see this article and photo) – and all 7 of us were trundled off to SD city jail. With the help of some wonderful supportive lawyers we all ended up diverted and doing community service, but when we staggered across the street with all our stuff the next day to move into Red House (or the red house as we called it at first) it was like we started out having survived something together that made us stronger. Of course at that time the 2-behind-infront condos next door were not there, there was a big side yard more than the length of the house which became a venue for many a community potluck/party/fundraiser. And for awhile the original OB Rag was produced in a shed in the back. I lived there for 17 months or so, but stayed on that last block of Cape May for another couple of years in the front unit of the Barracks. Red House was my first “home” in OB – I had been around for only 3 months or so and had thought to go back to Vermont at some point – but this was too good a situation to leave – a good home for myself and the community I was developing quite a loyalty to. I’ll never forget my years on the block that ends in the sand . . .
And thank you to the Gawronski’s. I so appreciate your sense of history and community. It is good to know that the story(ies) of Red House will be remembered and honored not just as a relic but a continuing symbol of community consciousness and identity. You folks rock!!!! 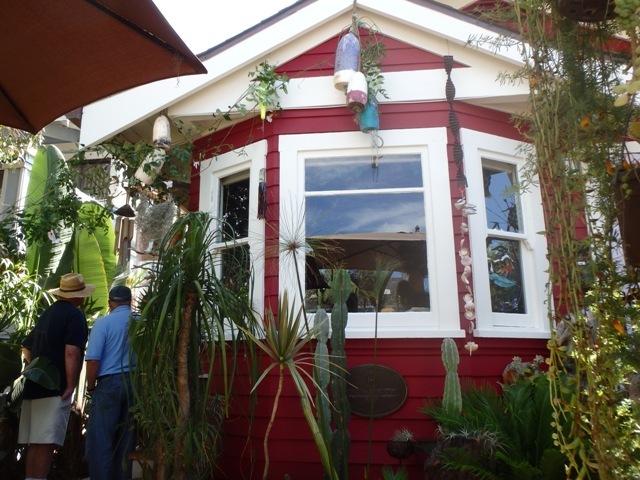 Newer Article: San Diego Gardening in July: It’s about the Water!